Aviation museum in Portage, Michigan U.S. 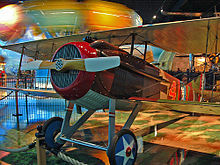 The Air Zoo, founded as the Kalamazoo Aviation History Museum, is an aviation museum and indoor amusement park next to the Kalamazoo-Battle Creek International Airport in Portage, Michigan. The Air Zoo holds many historical and rare aircraft, including the world's fastest air-breathing aircraft, the SR-71B Blackbird. Many of its antique planes are airworthy. Among its other attractions are a 180-degree theater that projects a 4-D simulation of a B-17 bombing mission during World War II; and various amusement rides, including flight simulators of a rocket trip to Mars, U.S. Navy F/A-18 Hornets, a stunt biplane, a hot air balloon, and more. Air Zoo is a Smithsonian Affiliate. The Kalamazoo Aviation History Museum was founded in 1977 by former Women Airforce Service Pilots (WASPs), Sue Parish and WWII pilot Pete Parish. The museum was dedicated to "preserving and displaying historical and military artifacts and to serving as a research and educational facility for this country and abroad." The doors opened on November 18, 1979, to great local acclaim, and the museum quickly developed into one of the 10 largest nongovernmental aviation museums in the United States. In early 1999, the name "Air Zoo" was adopted. The name comes from the fact that so many of the planes in its collection have animal nicknames like Warhawk, Gooneybird, and various cats like the Wildcat, the Bearcat, and the Hellcat. Also in early 1999, plans began for a major renovation. On April 25, 2003, construction began on a new 120,000-square-foot (11,000 m2) facility that doubled the museum's size and added flight simulators, amusement rides, Smithsonian Institution exhibitions, character actors, and a 4-D theater that combines 3-D films with special effects such as rocking chairs and plumes of smoke to simulate anti-aircraft fire. The new facility opened in April 2004. It holds the world's largest hand-painted indoor mural: "Century of Flight", by aviation artist Rick Herter, a 25,000-square-foot (2,300 m2) tribute to the history of flight in the main entrance. Across the hall is the 168-foot (51 m) "Night to Day" mural by Miriel Williams. There is also a computer-generated background on an adjacent wall. In June 2007, the Michigan Space & Science Center opened in the old building (East Campus). The building featured World War II aircraft, several artifacts from the defunct Jackson Space Center, and more. On October 1, 2011, the Air Zoo expanded its Main Campus again, moving everything from the East Campus into the new 50,000-square-foot addition. Half of this new expansion (known as the "East Wing") is devoted to the Space Theme, while the other half of the add-on includes World War II aircraft. The East Campus is now being used as the Restoration Center, which is noted for its work on aircraft including a Douglas Dauntless, a Sopwith Camel, and the newest project: An FM-2 Wildcat that had been lying at the bottom of Lake Michigan for 68 years. The Air Zoo contains different archival collections. Since September 23, 1995, the Air Zoo is home to the Michigan Aviation Hall of Fame. It also holds the Guadalcanal Memorial Museum, which is sponsored and maintained by the Guadalcanal Campaign Veterans Association featuring information about the fighting on Guadalcanal during World War II. ^ a b c Nowak, Ed; Pahl, Gerard (November 1996). "Kalamazoo Air Zoo: The Kalamazoo 'Air Zoo' airplane collection features several lively aerial 'animals' and plenty more". Aviation History. ^ Dittmann, Joan (June 8, 2016). "Michigan 'Zoo' highlights mechanical beasts of the air". Chicago Tribune. ^ O'Leary, Michael (April 2004). "New Aviation Museum prepares for takeoff". Air Classics. ^ Burcar, Colleen (2012). "Cougars and Tigers and Bears, Oh My - And They Really Do All Fly!". Michigan Curiosities: Quirky Characters, Roadside Oddities & Other Offbeat Stuff. Lanham: Globe Pequot Press. pp. 140–141. ISBN 978-0-762-79067-8. OCLC 890982021. ^ "Remembering an Aviation Legend: Sue Parish". Air Zoo. ^ Pradarelli, Melinda (September 1999). "Suzanne Parish: In The Pink" (PDF). Aviation for Women. pp. 30–33. ^ Turner, Terry (November 1, 2015). "Air Zoo offers more than typical museum experience". Sioux City Journal. ^ Butz, Bob (April 28, 2011). "Wild Aircraft Showcased at Air Zoo". Hagerty Magazine. ^ Prichard, James (May 1, 2004). "New Interactive Aviation Museum Has Rides". The Associated Press. ^ "New Aviation and Aeronautics Museum Prepares for Takeoff". Aero-News Network. February 14, 2004. ^ Prichard, James (March 21, 2004). "The sky's the limit for museum mural". The Associated Press. ^ "Expanded Kalamazoo Air Zoo prepares for takeoff". The Oakland Press. March 27, 2004. Archived from the original on September 18, 2004. ^ Bugnaski, Mark (July 1, 2016). "WWII bomber recovered from Lake Michigan arrives at Air Zoo for restoration". MLive.com. Wikimedia Commons has media related to Air Zoo. This page was last edited on 3 December 2018, at 13:25 (UTC).